Chinook’s TMK-IFAK Pouch and Insert combined creates a low profile, highly organized, and user friendly Individual First Aid Kit that is comparable in size to a standard AR/M4 double mag pouch. The TMK-IFAK Pouch and Insert kit holds the necessary medical supplies to treat the three leading causes of preventable deaths on the battlefield: Exsanguination, Tension Pneumothorax, and Airway Obstruction. The TMK-IFAK Pouch and Insert combines the unique design of both the IFAK Pouch and IFAK Insert into one complete system for quick and easy access to medical supplies; simply open the Pouch via the pouch access tab, remove the Insert with the large red grab handle, and open the Insert by pulling on its access tab. 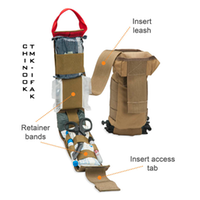 Using the elevator strap as a leash will allow the Pouch and Insert to be tethered together so that essential medical gear is never out of reach or dropped. The TMK-IFAK Pouch is made of 1000 Denier Cordura Nylon and is MOLLE compatible with PALS webbing. The TMK-IFAK Insert is made of 3” Military Spec Webbing. 2 Decompression Needle, 14 g x 3.25"